I was cruising down the road right after my afternoon class. The weather was fine and I am feeling fresh, something that is amazing since I had endured few hours of lecture. Taking the usual route on my way back, all of sudden I was greeted by makeshift stall along the road, nearby of TTDI, with smokes billowing to the air. Guess what? No, not open burning. If you’re a Malaysian, you might, just might have guess it. Yes, it is lemang! Lemang is actually glutinous rice with coconut milk wrapped in banana leaves then packed into a tube of bamboo and then smoked slowly over fire. Phew, such hard work. This delicacy may be available throughout the year but it is usually full blown with temporary makeshifts stalls everywhere during festivals celebrated by the Malay communities in Malaysia. The usual celebrations are the Hari Raya Aidilfitri and Hari Raya Haji. This Malay delicacy had been highlighted before by Boo from masak-masak. Boo featured lemang from last year’s Hari Raya Aidilfitri, from the same place I had acquired mine. As for Robyn, from EatingAsia, she and Dave had stumbled upon it along the Karak Highway. This week on Tuesday, it was the Hari Raya Haji celebration. It is known as the Pilgrimage Day of Celebration, which is to mark the conclusion of pilgrimage activites in the Holy Land of Mecca. What luck I have to get my hand on these ‘lemangs’ as I had missed it last year during Hari Raya Adilfitri. Thus, excited like a school kid eyeing a candy, I scrammed on the break and swerved to the left and came to a halting stop by the side of a stall. (Yes, we Malaysians drive like that). Just as I got down from the car, I was greeted by the enthusiastic seller, whose stall I happened to stop right beside. Since it was, as we Chinese like to call it ‘yuin’ (fate) that I got to this stall I decided to get a tube of lemang from them. They even let me sample one tiny piece. Not too bad I might say. I wanted to get their curries but alas, found my wallet insufficient of money. (I had just paid the bills!). Once I got home, I thrust the newspaper wrapped lemang to J and asked him to guess what it is. J just tore it off out of curiosity (such impatience) and was as excited as I am for the find too. Ah, but what are we to have it with? J, as the Malay cuisine expert here, said lemang have to have with rendang. 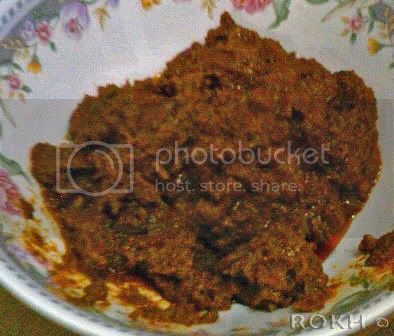 Rendang, according to Wikipedia, is actually meat curry, cooked in coconut milk and spices for several hours until the liquid dried up, leaving a thick coating of spicy condiments on the meat. Sounds good isn’t it. Not to worry as the recipe is to follow. Well, as this is also an entry for the Weekend Herb Blogging at Kalyn, I am featuring a herb used in cooking rendang. 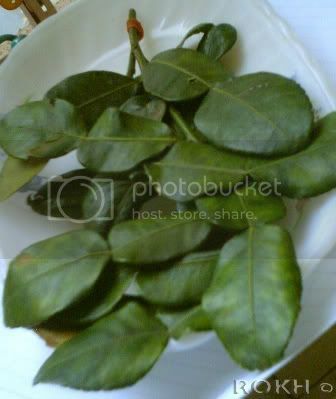 It is daun limau purut (kaffir lime leaves). These leaves, as the name implied, impart a strong scent of lime and are really refreshing. Now let’s go and make some rendang to go with the lemang. Pssst, as I know, it goes well with rice too! This is my first time trying out a tedious recipe but I was adamant. Yet, I was still pretty lazy and had come up with some cheating methods to fasten up the process. I got this recipe, once again from Amy Beh, but had modified the liquid amount, thus reducing cooking time tremendously. I was shocked by the amount of coconut milk called for in the original recipe and was further aghast by the idea of adding same amount of water. Thus I reduced it by more than half and had even left out the water portion. When I got to tesco looking for topside beef, there was none but instead I found packets of cubed beef labeled – beef for rendang. Talk about being ‘Malaysianised’ eh. Chilli boh is actually just grinded chillies with salt. Thus, if you cannot get it, I would recommend adding 2-3 sliced chillies to the level of spiciness you desire. Just remember that rendang are just spicy-nice, as in not too spicy yet just a tinge of kick. Coat bottom of a deep saucepan with a little bit of oil and heat it up. Add in beef and stir fry briefly till all sides are slightly browned. Sitr in the ground ingredients and stir to mix. Then add in the coconut milk. Simmer over low-medium heat for one hour until beef turns tender and the gravy is quite thick. Add kerisik and continue to cook until the gravy turns thick and dry. Add seasonings and daun limau purut.